UJAM Virtual Drummer is a virtual drum machine with different styles and loops. The different battery cells have been recorded and then virtualized and each instrument can therefore be used independently. You will find no less than 720 default patterns with choruses, verses, introductions and grooving outros. 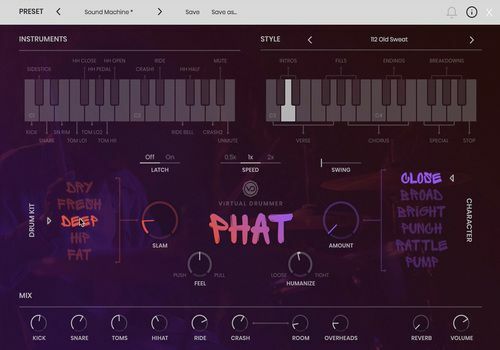 UJAM Virtual Drummer gives pride of place to urban sounds with G-Funk but also retro soul loops. UJAM Virtual Drummer Phat is compatible with the various music production software programs that support the VST AU and AAX plugins. Virtual Drummer Phat is available in a 30-day free trial version allowing you to evaluate its various features.